The only sources of income at the Baptist High School in Ekinrin, Kogi State, are school fees and support from the community. As a result, maintenance is often put off in order to be able to pay the staff, and the 1970s-era classrooms and dormitories were in bad shape. Some of the teachers are with the National Youth Service Corps, which requires them to work as volunteers for two years before they can be hired. The “Corpers” have no income to rent lodging, so the school provides a dorm for them, but it had become greatly deteriorated. Ekinrin Baptist High School was founded by missionary John B. Hill, and his son Baker—an NFW Council member—helped administer the first entrance exams there. Representatives from NFW visited the school in 2017 and were approached by principal and local chief Samuel Mejabi about help with building renovations. 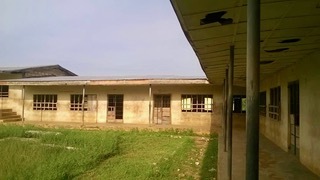 NFW provided funds to replace roofs on two classroom blocks and a damaged portion of the vice principal’s roof, as well as the ceilings in two rooms and the parlor of the Corpers’ Lodge. The staff and students provided the labor. The project was successfully finished in 2018.